Uganda Cranes striker Derrick Nsibambi has completed a move to Egyptian Premier League side Smouha SC according to reports in Egypt. The former KCCA FC striker who flew out of the country on Sunday is believed to have put pen to paper on a three year deal. 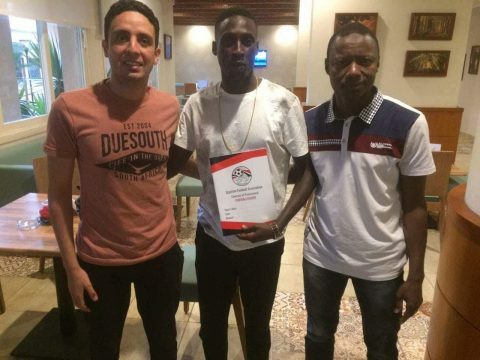 He joins two other Ugandan footballers who play in Egypt including his former team mate Isaac Muleme (Alassiouty sport) and Cranes vice captain Hassan Wasswa Mawanda (El-Geish). Before the start of the just concluded Uganda Premier League, Nsibambi was rumoured to have been courted by a un named Egyptian club but KCCA turned down their offer. Nsibambi has been struggling for form lately and has seen his starting role at KCCA FC taken up by teenage sensation Shaban Muhammad especially in the second half of the season. At the time of his departure from KCCA, head coach Mike Mutebi had come out and openly criticized him for his lack of consistency throughout the season. Nsibambi has scored seven league goals for KCCA this season. Whether he makes the grade and turns out to be a more prolific striker than he has been especially last season, remains to be seen. But his ability can not be doubted in the eyes of every Ugandan football can.